I was sitting behind a pint on a visit to Tuscon, Arizona, when my buddy, Todd, asked me about an upstart weeknight mountain bike race series happening in San Diego. "It's called Quick 'n Dirty," I said. "Victor Sheldon and I started it a couple months ago." Todd put down his pint and looked over half-amazed. "Victor Sheldon? You mean, The Slasher? That guy is a legend. I grew up watching him on ESPN's "Hot Summer Nights." I didn't realize Victor had a nickname, and I sure as hell had no idea of his accomplishments until I pulled up YouTube later that night. What I saw was a tropically tanned and blond-haired version of Victor in his early 20s, sporting a neon orange-and-green wetsuit, ripping full throttle through the open ocean on a jet ski, his signature leg-out cornering style in full effect. Then I looked up some stats and realized Victor was an eight-time National and World Jet Ski Champion, factory-sponsored by Kawasaki and Oakley. In my eyes, The Slasher's legend peaked in a 1994 documentary he starred in alongside Rob 'Vanilla Ice' Van Winkle. Yes, the Vanilla Ice. Turns out The Slasher and Ice raced against each other on the pro jet-ski circuit and teamed up with fellow jet-ski icon Christy Carlson to make the first motorized watercraft attempt on the New River Gorge in West Virginia, one of the most dangerous kayaking rivers in North America. The footage is priceless, not only because of Victor's astonishing skill on a jet ski but, to those who know him, it's apparent that he's still the same modest, fun-loving and family-focused guy he was more than 20 years ago. As a testament to Victor's modesty, when I later asked why he never said anything about his life as The Slasher, he shrugged his shoulders, flashed his signature smile and said, "You didn't ask." A few weeks later I went to his house and, inside his office, a window to Victor's past opened. 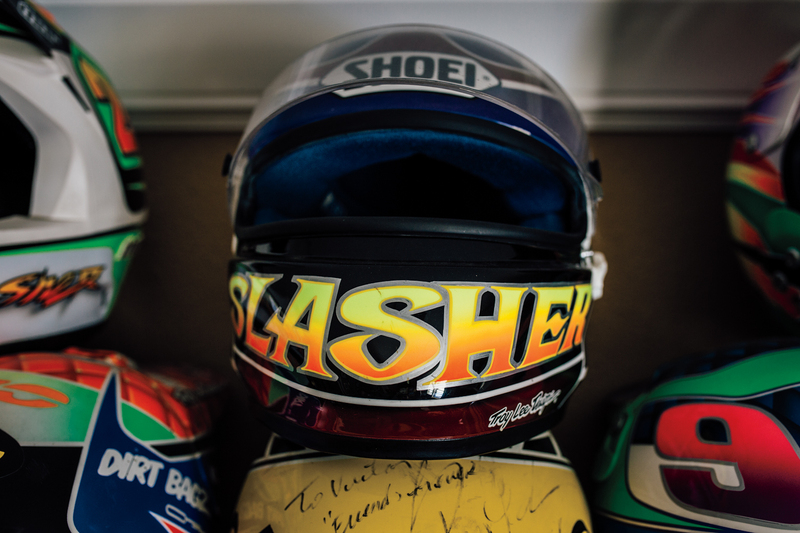 There were dozens of jet ski magazine cover photos, custom-painted helmets by Troy Lee and an old Oakley display case filled with unopened, original M Frames from the early 1990s. There was also a photo of Victor and Travis Pastrana high-fiving each other while 30 feet in the air on dirt bikes (Victor rips on a dirt bike too). Although Victor has lived his adult life in San Diego's North County, he spent his first 18 years in the polar opposite of Southern California: Anchorage, Alaska. Ironically, Alaska is where Victor got into jet skiing, in 1986 when a buddy let him take his ski out. The water was so cold that he had to wear a wet suit under a dry suit just to get in. That same year, Sheldon bought his first mountain bike: a bright-red Schwinn High Sierra. Until this point, Victor never planned to leave Alaska, but that changed one day when he went over to his friend Pat Crabb's house to hang out. "I saw Pat loading his van with his dirt bike, the same Schwinn I had and his jet ski. He said he was road-tripping to Arizona and Southern California to race his dirt bike and ride his jet ski. I immediately wanted in, so we started figuring out how to fit two jet skis, two mountain bikes and a dirt bike in the van." That one road trip changed Victor's life. After he'd been in the Southwest for a month, Victor's parents called and said they were leaving Alaska and moving to San Diego. With his sister already in Phoenix, Arizona, Victor's future was clear. "I told Pat I wasn't going home with him to Alaska. He was pissed. He had to drive the entire way back by himself, which included the ALCAN Highway in October. But I'm a family guy and although I still have lifelong friends up north, I had to be where my family was." 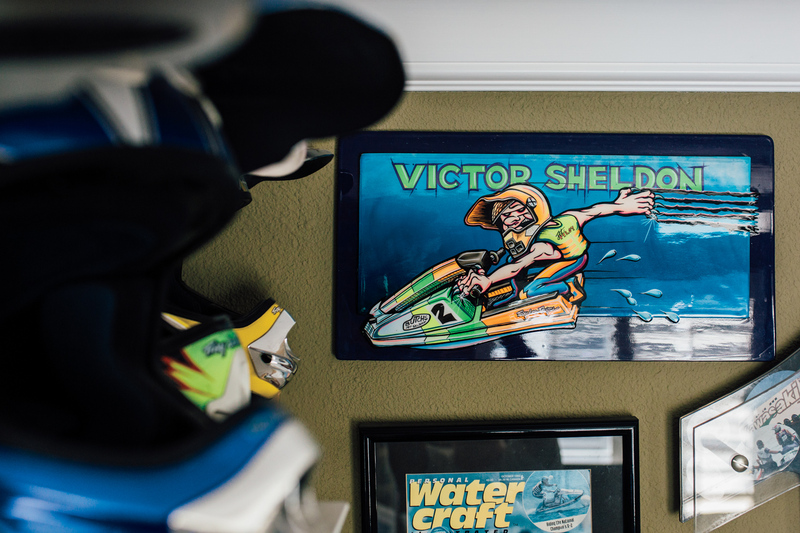 Victor caught the racing bug after watching the 1986 World Jet Ski Finals in Havasu City, Arizona. After only a year of competitive racing, he was voted Rookie of the Year and went pro at age 20. By 22, he had won his first national championship, buoyed by the support of his parents and sister who attended most of his events. Although Victor never raced mountain bikes during that time, his bike was always an essential escape from the rigors of jet skiing and a crucial cross-training tool. 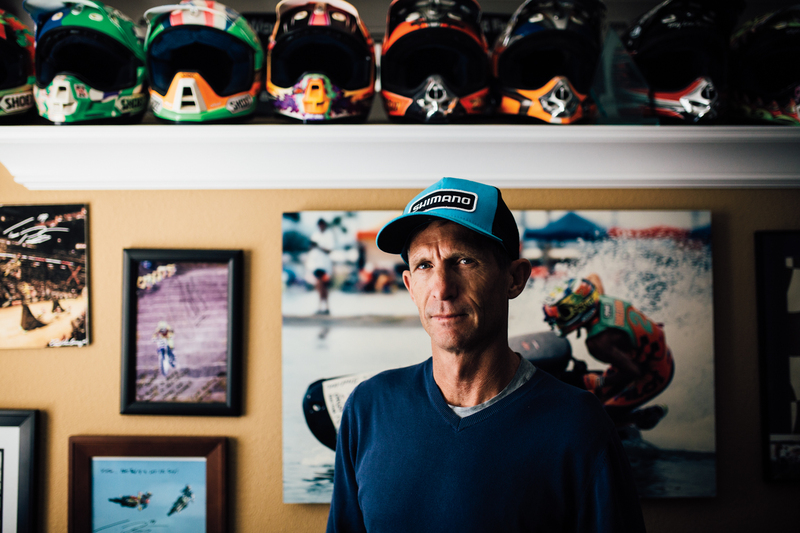 Since retiring from competitive jet skiing in 2005, Sheldon has shifted his focus to mountain bike racing, gracing podium after podium and often beating racers 20 years his junior. Now in his late 40s, Victor and his wife, Piper, have two daughters of their own. The family support structure continues to be a central part of Victor's success on the bike, with Piper and their daughters cheering him on to a Masters Cross Country National Championship in 2013 and a Masters Cyclocross National Championship last fall. "I'm the same guy I was in 1986 when this whole adventure started and Piper still lets me be what I've always wanted to be: a racer," he said. This deeply seeded family focus has not only helped fuel Victor's success as a sponsored athlete, but it has made him a beloved character in his local community. He sees all of his friends and fans as family and, as a result, his popularity is far-reaching. Just ask anybody who knows of Victor, and his or her eyes quickly light up with an exuberant, "The Slasher!" 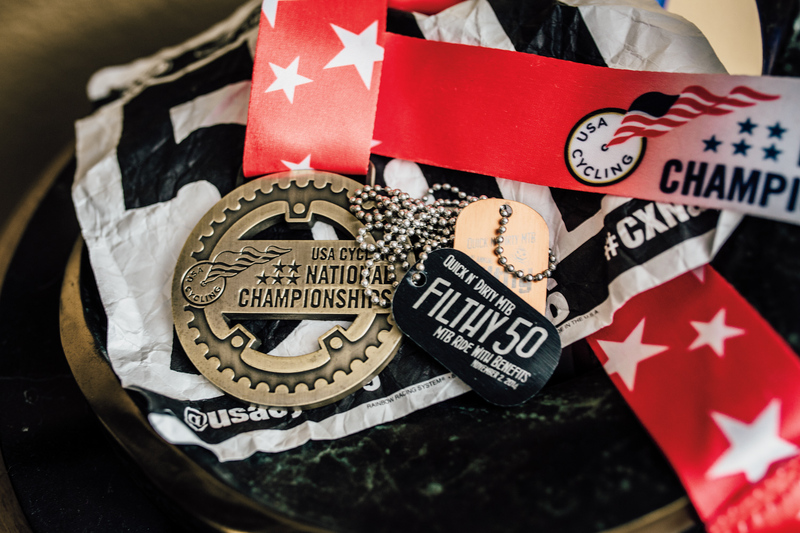 When Quick 'n Dirty started in 2012, it was a low-key, grassroots, weeknight race series in San Diego designed to get people out competing after work and home to family in time for dinner. But as soon as Victor started making phone calls to his friends to promote the series, boxes of swag began showing up at his house; sponsors wanted to be a part of what The Slasher was doing. Victor's family also showed up–siblings, in-laws and close family friends, including his father, Bill, 80, the most devoted and enthusiastic volunteer of the bunch, all stepped forward to help at the first Quick 'n Dirty. Based on all the smiles and high fives from spectators, participants and sponsors, it's clear that many align with Victor's family-focused vision, and that vibe has Quick 'n Dirty still rocking with as many beginners and families as it does racers looking for bar-banging action and hard intervals. Among the folks showing up to pin on a number are motorsports legends Johnny O'Mara, Jeremy McGrath, Wil Hahn, Chad Reed and Josh Hayes. Like Victor, these world-class athletes understand how valuable riding and racing a mountain bike is for their fitness. This trend of motorsports icons riding mountain bikes is helping expand the popularity of the sport to many who've never considered piloting two wheels without a combustion engine. And because of the balance Victor maintains between being a disciplined athlete and a father, he's able to attract both ends of the spectrum with events that are approachable, unintimidating and fun while still letting more serious folks work out their competitive urges. 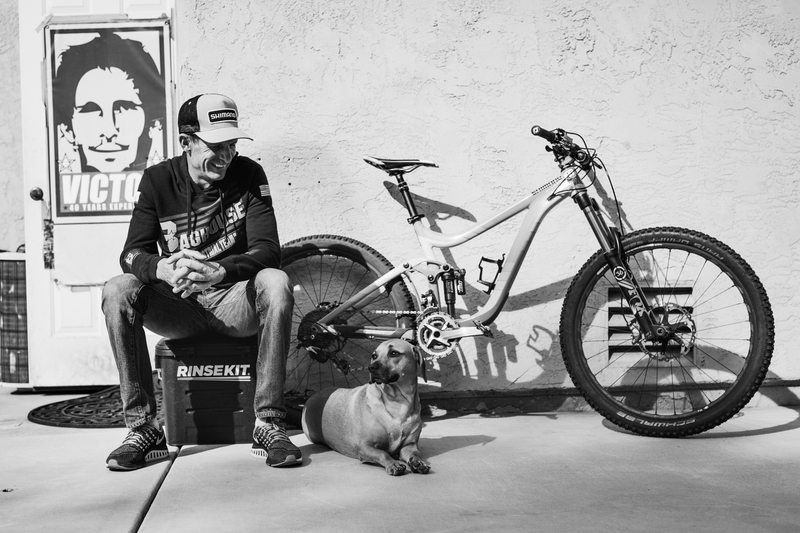 Victor may have been one of the first motorsport athletes to use mountain biking as a cross-training tool, but ever since he bought that High Sierra and a jet ski in the summer of 1986, the mountain bike has always been a core part of what makes The Slasher tick.